When you have a homestead there are certain things that need to be done each month throughout the entire year. Cleaning out the chicken coop is one of those things and if you live where it snows, something that you should do in the fall. I have found a great DIY chicken coop all-purpose cleaner that is natural and works amazingly well in our coop. This spray not only includes the ingredients needed to deter all those pests that like to show up when its cold outside, but also has a natural deodorizer that can freshen things up a bit for you, the owner, as well. 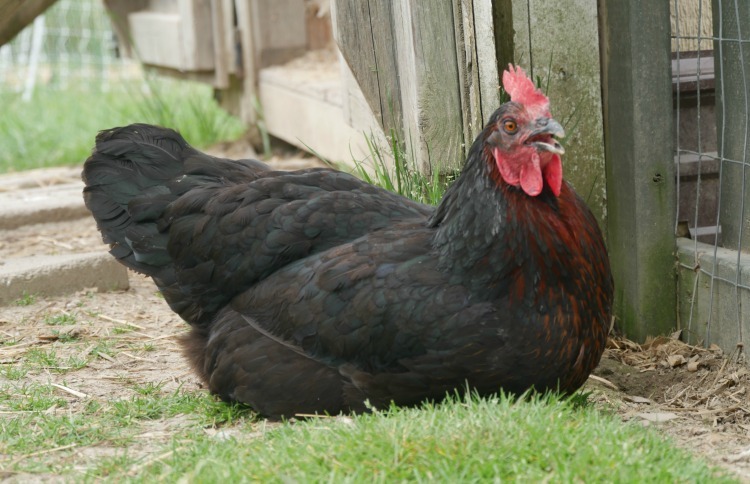 If you are brand new to raising chickens and you are not quite sure what all needs to be done when you are cleaning out your chicken coop, you can read my article HERE that will walk you through the steps. When I first starting raising chickens I did not realize that pro-health in animals is so much easier and more important than waiting for illness to arrive and treating it. Since then I have learned (the hard way) that providing a clean and healthy environment is the easiest and cheapest way to raise any animal….especially chickens. Why not try a natural spray that will clean, disinfect and help your hens fight those pests naturally and more effectively? In this day and age, eating clean foods with as few chemicals as possible is one of the main reasons we all homestead, so keep the chemicals out at all times and ensure you always have organic foods from egg to tummy! 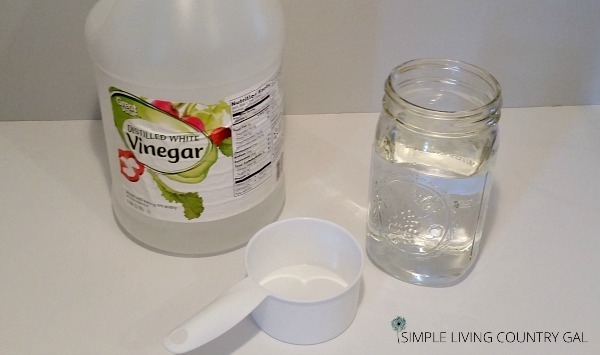 In a quart-sized mason jar, combine water and vinegar. Add the drops of essential oils and mix gently. Remember to mix before every use since water and oil separate naturally. 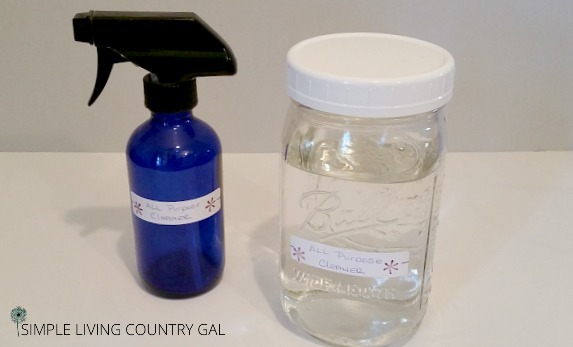 Label your mason jar with DIY all-purpose chicken coop cleaner and seal until needed. 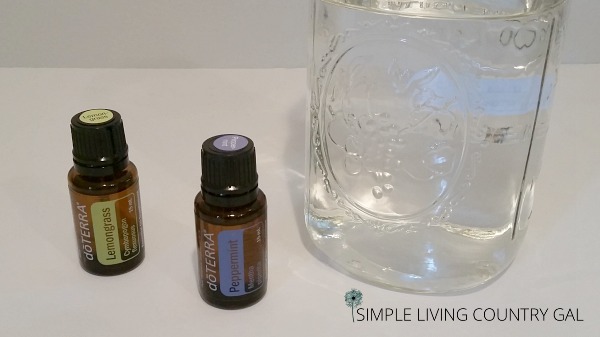 I simply pour in the amount I need as I need it, into my glass spray bottle. Glass is needed when using essential oils in order to keep the integrity of the oil intact while being stored. If you plan to use the entire bottle in one go, then a plastic spray bottle should be fine. In my case, since I prefer to spot clean weekly I store mine in a glass spray bottle and glass mason jar. This DIY all-purpose chicken coop cleaner is great to use on any surface. Make a schedule of your weekly and monthly chores to help ensure you do everything on your maintenance list. Keep that list in your home and on the coop door as a visual reminder of what needs to be done when. This extra step will help you to deter disease before it hits, which is, after all our number one goal as homesteaders! Remember our animals depend on us for their care so it is important to give them the very best and most natural home and coop that we can. I know oils are the new buzzword, so do not jump into them lightly. Do your research and commit to making a change for your homestead, your animals, and your family. Have you tried this DIY chicken coop all-purpose cleaner yet? If so, what did you think? Great article! I am new to chickens …. getting my baby girls this week!! I’ve been doing a lot of research on their care and came across this cleaning solution. Where do you buy your essential oils? Is there a specific brand or type, or is that not important? You say lavender in the directions but the picture is peppermint! Which is it? Oh for heaven’s sake…Lavender is what it’s supposed to be Thank you so much for pointing it out!